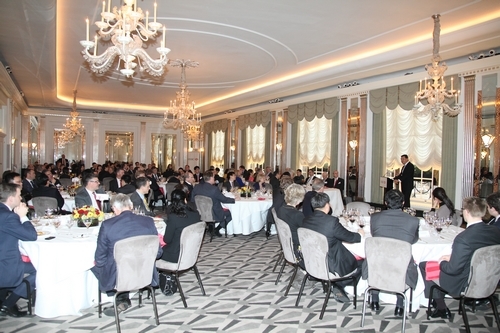 It is a real pleasure for me to join you at the HSBC lunch of the Chinese New Year, the year of the Snake. It has been my honour to be invited to attend this HSBC Chinese New Year lunch for three consecutive years. On each occasion this has been a most stimulating and enjoyable gathering. So, I want to thank HSBC for its hospitality and organization. As we look back on the year of the Dragon, we have every reason to say that China-UK economic cooperation was soaring like a flying dragon. In 2012 China-UK trade in goods for the first time topped 60 billion US dollars. Last year Britain was the only EU member that enjoyed growth in both exports to and imports from China. Chinese investment in the UK surged to more than 8 billion US dollars. This was more than total Chinese investments in Britain since 2009. Great advancements were also made in China-UK cooperation in infrastructure, advanced manufacturing, creative industry, research and development and offshore RMB business. 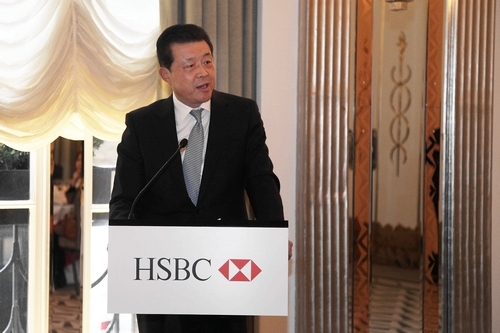 · In 2012 HSBC group invested 1.6 billion RMB in China. This was a telling example of how much HSBC set store by the Chinese market and its high expectations of its business in China. · HSBC now has the largest number of outlets and the widest geographic reach of any foreign bank in China’s mainland. · HSBC has the largest scale of RMB business among all foreign banks. · In 2012 HSBC was awarded Best Foreign Retail Bank in China; Best Cash Management Bank in China and Best Risk Management Bank in China. · HSBC is among the first batch of market makers to be approved to conduct CNY-JPY direct trading in the inter-bank foreign exchange market. · HSBC is also among the first banks in China to conduct non-principal-exchange currency swaps in the domestic inter-bank market. · Last but not the least in 2012 HSBC raised 2 billion RMB in London in the first renminbi bond issue outside China. I offer my hearty congratulations to your outstanding achievements! At the same time I want to thank HSBC for long standing support of China related charitable causes. These include China’s educational and environmental protection programmes. Up to now your total donations in the mainland of China has reached 600 million RMB. Just now we watched the brilliant performance of lion dance. In Chinese tradition, to empower a lion to do its duty is to bring it to life by the eye dotting ceremony. After the ceremony the lion will open its eyes and show its spirit and courage. I know the lion is the symbol of HSBC. In my view HSBC is in every sense a true lion, a lion with strategic vision and high ambition. A lion like HSBC needs an exceptional stage to bring into full play its potential. And China can provide such a stage. The Chinese economy has very bright prospects compared to the developed countries of the world. Indeed, Chinese financial markets holds out limitless opportunities. · And gradually make the RMB capital account convertible. The 18th Congress also made it clear that China will increase outbound investments. Also Chinese enterprises will go global at a faster pace. These measures will certainly open up more space for broader China-UK financial cooperation and create more business opportunities for HSBC and other foreign banks. Looking forward into 2013, the ‘year of the snake’ I hope HSBC will carry on its enthusiasm and confidence in the Chinese market and seize the opportunities. I expect HSBC will enjoy success as it has done in the past 148 years! I hope HSBC will continue to expand its business in China and broaden cooperation with Chinese partners. I hope HSBC will remain the champion of China-UK economic and financial cooperation. In English the abbreviation of Chinese New Year is CNY. It is such a coincidence that CNY is also the currency code of Renminbi. So I believe HSBC is fully aware of the double meaning when it celebrates Chinese New Year. That is probably one of the reasons why Chairman Flint said the year of the Snake is also the year of the RMB. As you know in China wishing double prosperity and happiness is a deeply held tradition. So in conclusion, I wish all of you double good health, successful careers and a prosperous year of the Snake!